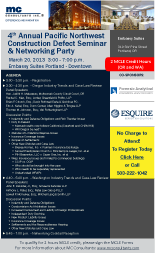 MC Consultants presents CLE approved educational conferences for members of the construction industry, attorneys, financial institutions and insurance professionals. 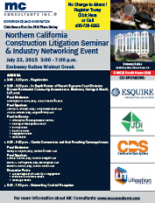 Topics include discussions of construction defects, risk management, coverage issues, litigation management, and insurance issues arising out of construction related claims. Contact us for more information. 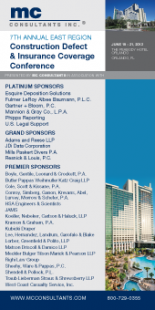 MC Consultants, Inc. is a sponsor of the 2018 CLM & Business Insurance Construction Conference, which will be held in the Chicago Marriott Downtown Magnificent Mile from September 26 – 28. This Conference covers all aspects of insurance, risk, and claims management aspects of the insurance related to the construction industry. 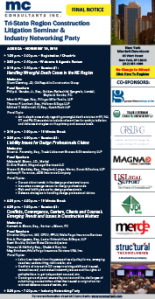 In addition to addressing construction defects and other hot topics, conference sessions will also address facets of construction site accidents/injuries, coverage issues, subcontractor issues, risk management, and new technologies. Sessions will address issues on the national, regional, and state levels. In addition to the interactive educational sessions, conference attendees will have many opportunities to network with other thought-leaders in the industry. 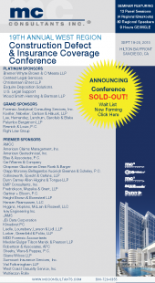 MC Consultants, Inc. is a sponsor of the 2017 CLM & Business Insurance Construction Conference, which will be held in the Manchester Grand Hyatt from October 9 – 11. This Conference covers all aspects of insurance, risk, and claims management aspects of the insurance related to the construction industry. 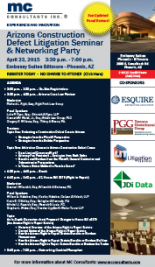 In addition to addressing construction defects and other hot topics, conference sessions will also address facets of construction site accidents/injuries, coverage issues, subcontractor issues, risk management, and new technologies. Sessions will address issues on the national, regional, and state levels. In addition to the interactive educational sessions, conference attendees will have many opportunities to network with other thought-leaders in the industry. MC Consultants entered into a definitive agreement with CLM (Claims & Litigation Management Alliance), to merge our respective construction conferences and jointly produce a national construction claims conference. This September, the CLM will hold the most comprehensive construction claims conference ever. 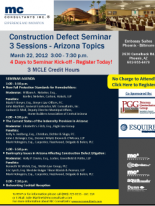 In addition to addressing construction defect claims, conference sessions will also address facets of construction-related claims including construction site accidents/injuries, coverage issues, subcontractor issues, and new technologies. Sessions also will address issues on the national, regional, and state levels. 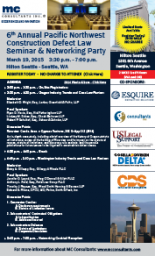 In addition to three days of interactive, educational session, conference attendees will have many opportunities to network with other decision makers who work within the construction claims industry. MC Consultants looks forward to serving as the exclusive Diamond Level Sponsor. 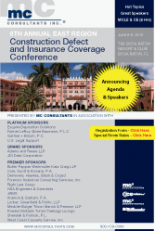 Our 21st Annual West Region Conference will address the construction defect issues that affect attorneys, carriers, and builders within the next 12-24 months. 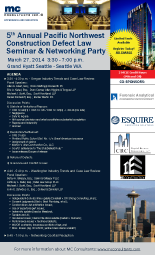 Our 20th Annual West Region Conference will address the construction defect issues that affect attorneys, carriers, and builders within the next 12-24 months. 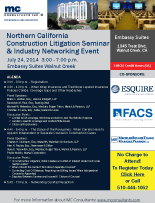 This conference will address cutting-edge East Region construction defect issues that affect attorneys, carriers, and builders within the next 12-24 months. 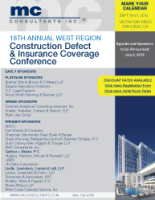 Our 19th Annual West Region Conference will address the construction defect issues that affect attorneys, carriers, and builders within the next 12-24 months. 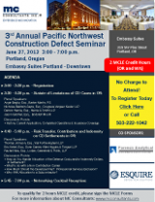 Our 18th Annual West Region Conference will address the construction defect issues that affect attorneys, carriers, and builders within the next 12-24 months.